Yours truly has been charged RM4 for unsolicited service! Yours truly has been charged RM4 for a renewal of a service, which yours truly had never subscribed to. 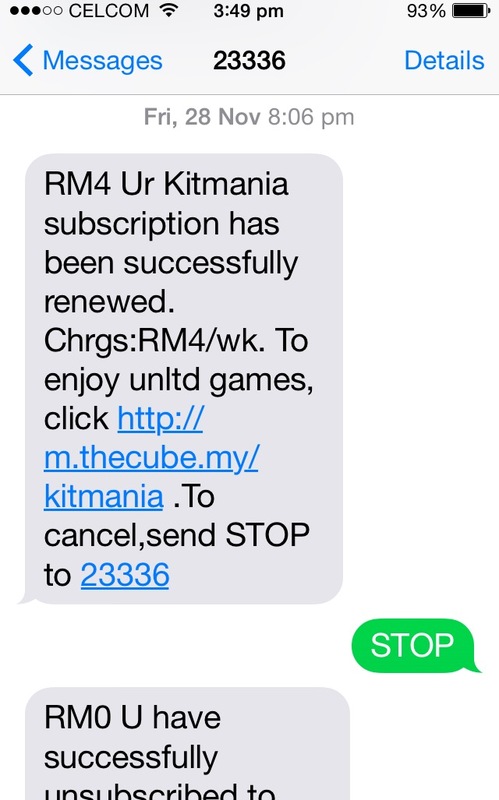 Yours truly is certain that there were many million of unsuspected subscribers that have been charged with the fees of RM4 for the so-called services provided by Kitmania. Of course, yours truly had sent the message “Stop” and was informed by another sms blast that “U have successfully unsubscribed” otherwise a RM4 will be charged. Just imagine RM4 is charged to 1 million unsuspected subscribers and 500,000 did not respond, this MCS provider would have gained RM2 million by just a press of a button. But there are easily more than 20 million mobile phone subscribers in the country. This must be another form of “Get Rich Quick Scheme”/“Skim Cepat Kaya”. Yours truly has reason to believe that such unethical business practices have been going on for sometimes and many unsuspected mobile telephone subscribers did not bother to read and/or respond to the Short Code/SMS blasts, which contained unsolicited advertisements and promotions as in HERE. Yours truly has been informed that many complaints have been lodged against such unethical business practices and other similar dirty tactics schemed under the word “promotions” with the MCMC. Unfortunately, little or no actions have been taken by MCMC otherwise such unethical business practices would not have occurred as recent as on 28th November 2014. May be MCMC is too preoccupied with awarding huge contracts to dormant companies which can be seen in HERE and HERE. The Minister of Information is duty bound to explain to the public why such practices by Mobile Content Service Providers are allowed to go on unchecked by MCMC. In the interim, the Ministry of Information must freeze on all applications for approvals by MCS providers to provide such “services” via short codes within the mobile telephone industry. This is daylight robbery. Kerajaan kita ini dipenuhi mereka yang berkhidmat untuk rakyat atau mafia? Perbuatan merompak pengguan telepon bimbit ini berleluasa sekian lama namun seolah tidak ada apa pun tindakan. Ada orang dalam terbabit dalam sindiket. Orang Kemaman harus teliti jika tidak rosak reputasi bila menjadi kes jenayah. Tuan, I pun kena once. Complained and given a number to get them to block this deduction, at a small fee of ‘cos. Recently top-up prepaid RM50 to subscribe RM38 Celcom broadband. Checked with #124* three minutes later, balance remaining RM2.00. Happened once that was the reason I immediately check. Complained to Celcom… Few hours later they refunded the missing RM10. So for those who never checked RM10 gone. If they do this to 1m subscribers, easy money of RM10 for them. Pse ensure you check your balance regularly. MCMC is more keen in giving out huge contracts then safeguarding public interest. As long as Sharil is there to head it, MCMC will not have the credibility and/or moral standing to enforce regulations that protect public interest. The evidence is so clear that there were violation of the Personal Data Protection Act and other rules. Lets see Celcom, MCMC and Jabatan Perlindugan Data Peribadi. MCMC is a useless law enforcing agency. We are left with the Jabatan Perlindungan Data Peribadi. As usual, everyday million of Rakyat have beeen cheated by such dirty tricks. I hope that the Minister of Information will ensure that this matter is investigated properly but please minus the Botak – because he himself had to be investigated first.